The reports from across the country are dismaying: Food pantries are running short and cannot meet the needs of all those seeking help. In the Department of Agriculture's most recent study of hunger in America, released in November, more than 35.5 million Americans, including 12.6 million children, were found to have "low" or "very low food security" (defined as households where hunger was prevalent, where there was not enough money to buy adequate food supplies, where food purchased did not last, or where family members had to cut down or skip meals - sometimes not eating for a day or longer). That's roughly 1 in 9 households. And the numbers are rising from last year. Everywhere, people are feeling the crunch of rising gasoline and grocery prices, as well as utility bills, rent and mortgage payments. Those factors also are cutting into people's ability to donate to food banks for others in need. "Not only can they not give, many - for the first time - have need and are coming to us," says Melissa Temme, a spokeswoman for The Salvation Army, where stories like that of the overflow at the Johnson County Family Lodge in Kansas are becoming increasingly common. Last year, 4.8 million Americans got holiday assistance from the Salvation Army, everything from meals and clothing to gifts. It is too early to tell if those numbers will go up this year. But while her organization generally sees a surge in giving of gifts and money right before Christmas, Temme says she has sensed a general unease among staff about the level of need that is out there. "This isn't a holiday shortage, per se. This is a shortage that's been building," says Ross Fraser, a spokesman for America's Second Harvest, a domestic hunger-relief organization based in Chicago. At Thanksgiving, the organization estimated that food banks nationally were short a total of 15 million pounds of food, or roughly 11.7 million meals. Since then, his agency has heard about recent shortages at food banks, from New York, Illinois and Tennessee to Texas and California. One food bank in Dallas reports having to spend $100,000 a month buying food, because of declining donations of excess food from grocery stores and farmers through the U.S. Department of Agriculture. "I don't think anybody ever thought food banks would be going out and buying food," Fraser says. One food bank in Orlando, Florida, he says, told of a single mother who was forced to get food donations because her income as a real estate agent fell from $66,000 last year to just $18,000 this year, due to slumping housing sales. CBS's Nashville affiliate WTVF reports that at the Second Harvest Food Bank of Middle Tennessee, while donations are not down, more people are asking for help. These days it's hard to keep the pantry stocked at the St. Luke's Community House in West Nashville. "When you see empty, empty shelves, that means there are empty stomachs in this neighborhood," development director Chris Sanders told WTVF. 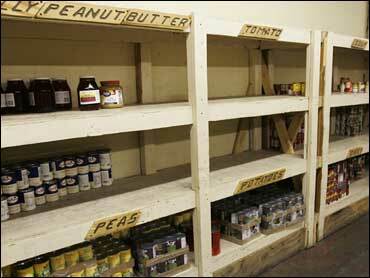 This makes life even harder for the families who depend on the food pantry. "The combination of more people coming in plus less food available is really causing us, in some cases, to have to give smaller food baskets," Sanders said. With rising costs, the working poor face uncomfortable decisions, said Marina Falzone, director of marketing and communications at America's Second Harvest. "They have to make a choice: do I heat my home for my family, do I purchase food, or do I purchase gas to go to work?" Grocery stores are helping to make giving easier, by selling pre-made food bundles which shoppers can buy and donate. Rebecca Wagner, executive director of Community Ministry of Montgomery County, Maryland, also has seen the need for emergency aid growing among the working poor. "Before they were cobbling together three and four jobs to make ends meet," Wagner says. "Now that utility bill is a backbreaker." She has been encouraging donors to make pledges beyond the holiday season - for instance for utility bills and rent next year. "Toys and bags of oranges only go so far when you can't keep your heat on," Wagner says. But, she adds, families always appreciate the help at the holidays, too. "All of it helps," she says. Some solutions are more creative. CBS's Odessa, Tex. affiliate KOSA reports that the Andrews County Library is accepting donations of canned foods in lieu of library late fines. And avenues for making donations are increasing. For example, there is a Facebook group, and affiliated Web page at Do Something, with a goal of reaching 1 million donated canned goods.